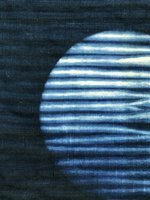 In this two-day workshop led by Glennis Dolce, continue working with indigo and shibori dyeing using a broad selection of beautiful fabrics, both vintage and unique. Shibori techniques of itajime, arashi, nui, and more will be practiced with both new and continuing students. Focus on combining techniques. $72 members, $90 non-members, plus $40 materials fee due to instructor at the beginning of class (cash only). Limited to 20 participants. Museum admission included. JANM . Last modified Mar 17 2019 5:49 p.m.